Palate Cleansing with TEA – Indulge Your Tastebuds! Do you respect the food you spend time cooking, or paying for in a restaurant? It may surprise you to know that the drink you choose to consume with the food that you eat may not be doing your meal justice. Tea cleanses and enhances your palate, clearing the taste buds. I can recall as a child going out with my Mother to have Afternoon Tea with her friends. I was in awe of the three tiers of cakes the waitress would bring to the table on a platter. Afternoon Tea had been going on for centuries, the ritual of drinking tea with cakes and pastries, but did anyone ever wonder why? Cakes and pastries leave a thick residual feeling in the mouth, but a sip of black tea after each bite cleanses the palate so that the next bite feels like the first bite all over again! Brilliant! 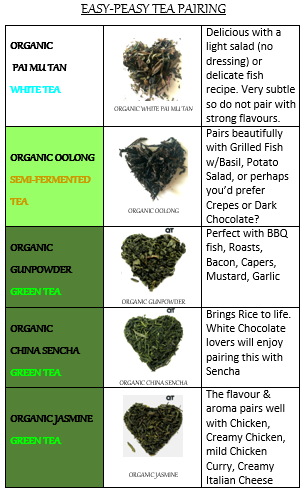 Of course, today we have many more options available to us and we’re spoilt for choice, black tea such as English Breakfast, or fruity varieties, or white tea, an oolong, or a smooth green tea, all would be perfect palate cleansers . Enjoy a wine with your evening meal? Dont we all!? Wine, along with most other beverages however, doesn’t actually serve to cleanse the palate, so next time you’re planning a special evening, why not try pairing your food with tea? It will take your taste buds on a whole new journey! And if you’re entertaining at home, it’s actually lots of fun to experiment and decide which tea you will use to compliment and enhance each course/dish. In our next blog we’ll bring you some easy tea pairing tips and infographics to help get you started!